This has to be one of my favorites images to date taken at The Barn at Rock Creek. Alex is such a timeless beauty, and when she put on her wedding down from Coastal Knot she became the epitome of that beauty. She combined several pieces from different designers to provide her final look seen here. 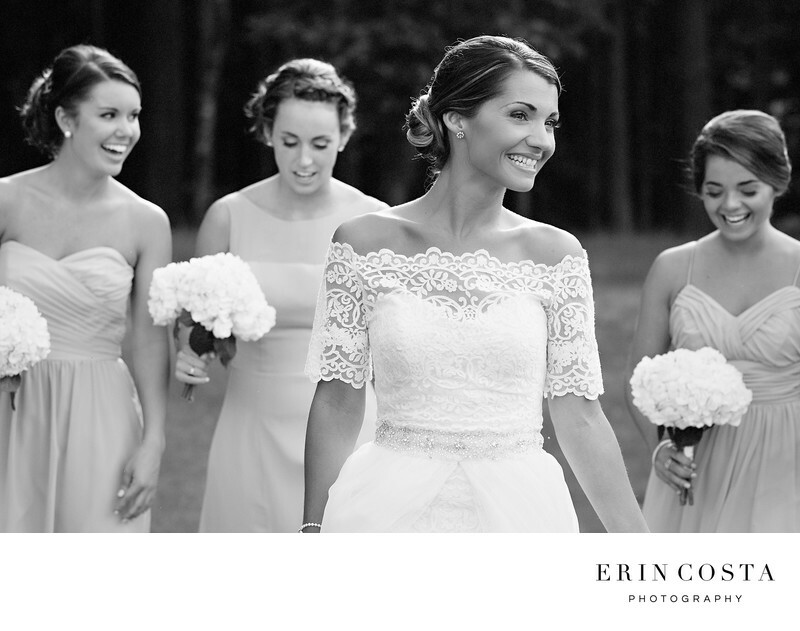 Her bridesmaids all wore a shade of blush pink in several different styles of dresses. We were finishing up with the bridesmaids group photos, and I had the girls spread out and go for a walk towards me just talking among themselves. The guys were behind us chatting and trying to make the girls laugh, and the result is this stunning candid of Alex laughing carelessly as she was walking through the grass. It had been cloudy most of the day, but the sun came out briefly while we were taking photos, providing just a kiss of light on the backs of the girls heads which provides some separation between them and the trees in the background. I love photographing weddings at The Barn at Rock Creek because there are so many places to photograph, and boundless options on ways to make the venue your own.